Melody Larson, Bill Larson, Joie Worthen, Fred Yeatts, Sheri Yeatts, Tricia Watson, Steve Watson, Suzanne McCrudden, Neal Skaufel, Joann Skaufel, Sandy Byington, Alisa Wintermute, Scott Wintermute, Jenny Skaufel, Cyrus Bowthorpe, John Worthen, Eric Gagnon, Glenna Trout, Amy Soto, Frank Soto, John Bishop, John Marx, Brenda Cartwright, Chris Manos, Teya Dyan, Chris White, Amy Milliken, Steve Milliken, Christopher Sutherland, Jessa Sutherland, Garrett Sutherland, Titus Sutherland, Bill McMahan, Mark Eichin, Susan Irwin, Greg Davis, Kaitland Soto, Zack Shaw, Brian Robinson. Muscles members from Canada Sharron Lyons, Sandy Bosma, Martha McDonald. Muscles members from the UK Bernie Morgan, Colleen Morgan, Phil Boswell, Adam Osborne, Katie Osborn, Steve Kent, Beckie Kent, Kevin Farnworth, Frances Farnworth, Doug Paine, Ed Usher, Greg Barnes. Muscles for Charity (USA) was launched in Bellevue, WA during 2005 at the annual EastSide Domestic Violence Auction and Dinner and immediately raised over one thousand dollars for the teams services. Subsequent auctions for a variety of registered charities, especially ‘Helping Hands for the Disabled’ have raised thousands of dollars as the team undertook jobs from Shoreline to Sequim and Federal Way to Redmond. Muscles for Charity is registered with the State of Washington, Secretary of State Office as an exempt charitable organisation. (Registration Number 30486). Registration dated 20th May 2011, confirms that Muscles for Charity is exempt from annual renewal or providing the Secretary of State with copies of financial information. US Muscles team volunteers are therefore able to claim on their tax returns for any out of pocket expenses incurred while traveling to/from Muscles projects for any organisation which is recognised by the State as a registered charity. As part of the registration Muscles has also been issued with a Federal EIN number, although the team and all our volunteers never handle any money. Muscles USA members have also travelled to Europe to work alongside their UK and Belgium colleagues. Notably in the spring of 2010 when team members joined forces and descended on a Hotel in the southern Austria ski resort of Bruck and Zell-um-See. During the summer of 2015, the Pacific Northwest volunteers will play host when the ‘Belgian Invasion’ includes seven members of that nations team visiting for a three week period. The energy and enthusiasm behind the US team leader is reflected in the team leader, (Mel)Ody Larson from Issaquah. 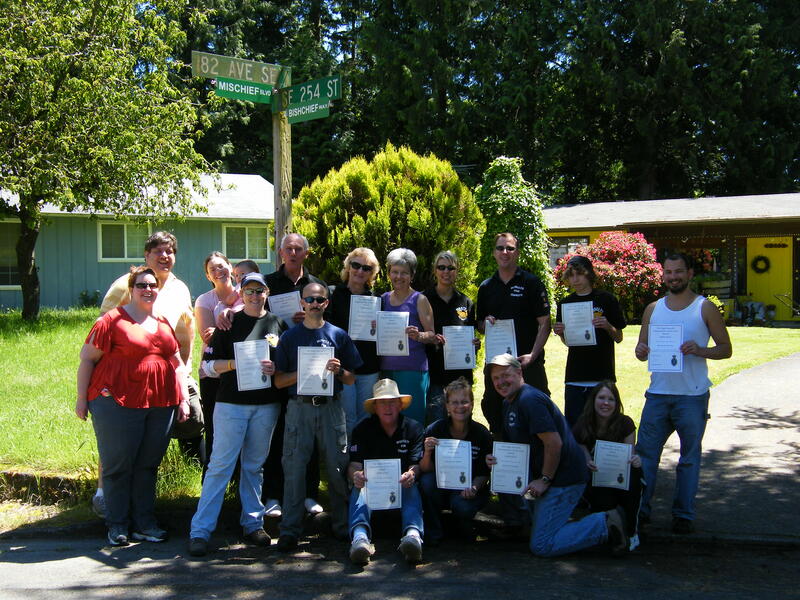 Members of the Muscles USA team proudly display their certificates issued by a High Sheriff in the UK for ‘Outstanding commitment to the community’ during a project in Covington, WA in June 2010.